Previewing tomorrow's top 15 matchup in the Big House! 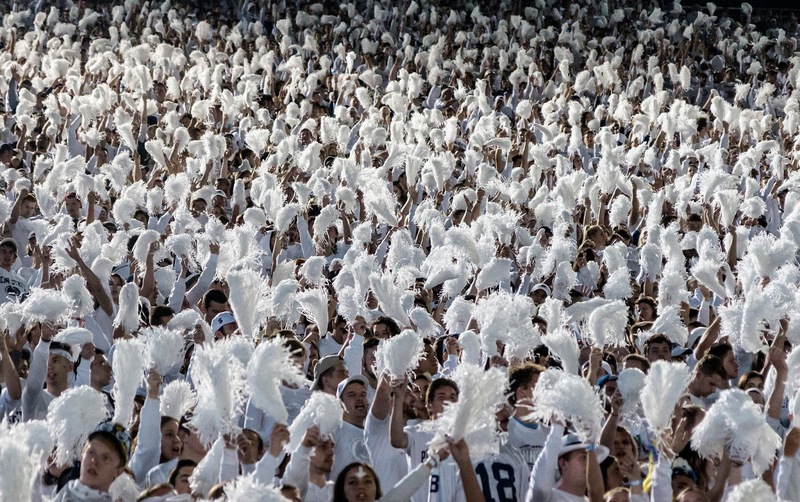 Penn State is fascinating in that they have the world's biggest alumni association, the country's second largest football stadium, and is a top 15 ish college party town. Yet despite all this, they have no historical identity because it was wiped out, and rightfully so, as a result of clean-up for the terrible horrible thing. Go to any Michigan game and you're sure to be bombarded with Bo Schembechler propaganda, Lloyd Carr holding a national championship trophy, Rose Bowl, and Big Ten Championship highlights. Go to a game at Beaver Stadium and you're bombarded with house party music and a gimmicky announcer that you would expect to hear at Northwestern or Purdue. Given the spectacular atmosphere of the Penn State whiteout (a tradition that the Nittany Lions still rock), it still feels strangely empty. 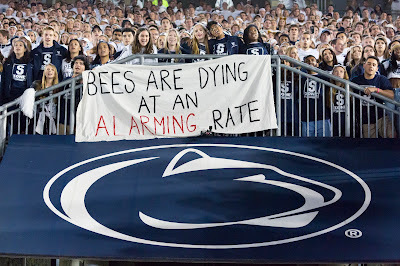 At the Penn State game last year I was, for the most part, pleasantly surprised by how far most people had moved on from the their horrible past. You would pass by the occasional truther or historical photo, but for the most part this is a program that is ready to move on from a dark period. I applaud most Penn State fans for this. Still, what do you do when the entire identity of a program has been blacked out? What do you do if you're a life-long Penn State Fan who has just had to realize that the last 61 years of entertainment was smeared by the biggest black mark in college football history? Ah James, you magnificent enigma. James Franklin who iced his own kicker against Iowa. But who also iced a Georgia State kicker while up 56-0. And kicked one of the world's saddest field goals from the 2 yard line. Penn State kicked a field goal down 28-0 again Michigan this season. This man won the friggin Big Ten Championship in 2016. Penn State, this is your identity now. The emotional roller coaster involved behind spectacular jubilation and thrilling plays coupled with the two to three bricks lodged in your television that you threw is one I don't care to ride every week. 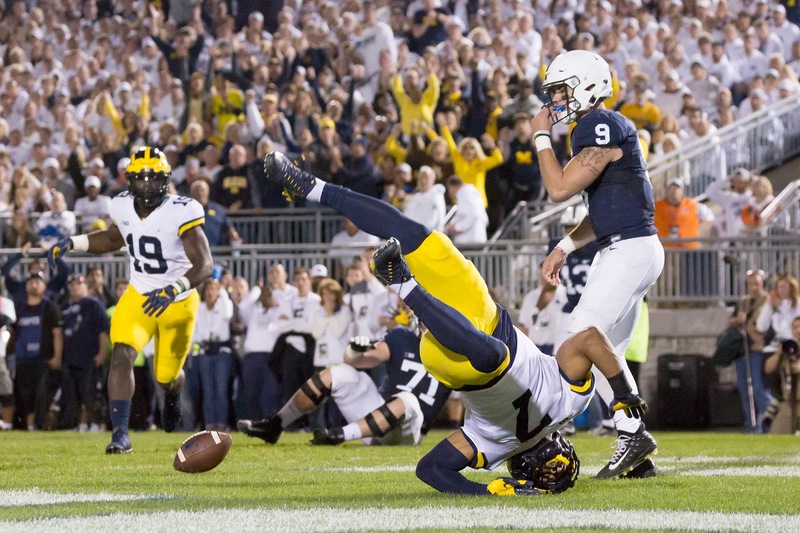 Last year's game at Happy Valley was the worst performance of Don Brown's career at Michigan. Trace McSorley threw for 282 yards, Squon Barkley added another 100 on the ground (69 of which were on Penn State's first offensive snap #NotNice), and the Nittany Lions racked up 42 total points. Don Brown has not forgotten this. "Just to let you know, I wake up every morning and I think about it. Honest." That's not a good sign for Trace McSorley. Joe Moorhead, the offensive coordinator mastermind that picked apart Don Brown's defense last year has left to become the head coach for Mississippi State and Penn State has seen a semi-noticeable drop. Last year's team ended up with the #10 S&P+ offense, but has declined to #22 after eight games in 2018. 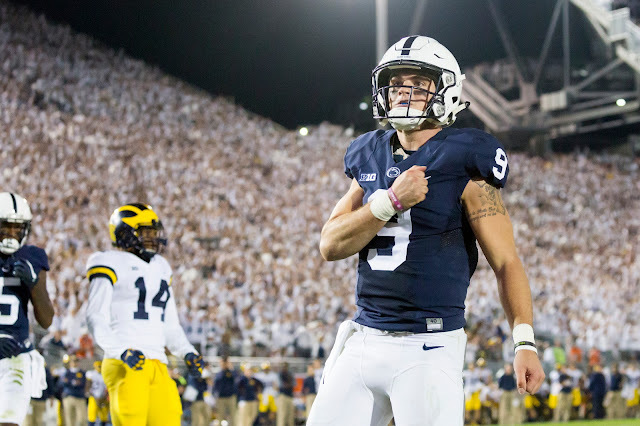 Quarterback Trace McSorley (#9) is back but with a serious quarterback rating drop. Per ESPN, his adjusted QB rating of 81.5 in 2017 has dropped to 64.6 through October in 2018. McSorley's TD/INT ratio (12/4) is solid, but a 52.8% completion percentage is a problem that is not entirely his fault. The 5'9" 173 lbs receiver makes one cut and then takes off. ESPN clocked him at a 4.43 40 time in his recruiting profile (and was 156 lbs coming out of high school). Both plays linked above are in a game where Penn State had a 95.9% chance of winning. I mentioned the thing about James Franklin and the coaching? The not great decisions thing? I did? Ok we can move on. It should also be worth noting that he had a 78 yard run play in this game. Outside these two runs he had 36 yards on 15 carries (2.4 avg). Penn State needs to rely on their powerful running backs because the offensive line itself is fairly meh. When Sanders isn't making big plays, we get a performance similar to their Ohio State game, or Iowa (62 yards on 17 carries, 3.2 avg). Trace McSorley has also been sacked 15 times this season. The other running threat is Trace McSorley himself. He's already gotten 617 rushing yards on the season and is very shifty. Remember that Ohio State game that James Franklin threw away because of the coaching reasons mentioned earlier? Don Brown has not forgotten last year. Don Brown had a bye week to prepare for this. Penn State's defense is a combination of guys who are really dang good at what they do and some guys that are fairly average-good at what they do. Let's start with the dang good. The Nittany Lions have some Michigan-level depth at defensive end between Shareef Miller (#48), Yetur Gross-Matos (#99), and Shaka Toney (#18). The three have 15 sacks between them. Michigan's tackles have been the highest rising stock for the Wolverines all season, and if anything this should be the match-up to watch. Juwann Bushell-Beatty came out of the MSU game with an injury but reports seem to indicate that he is ok. But overall the rush defense has not been stellar. Penn State's tackles are Kevin Givens (#30) and Robert Windsor (#54). Windsor is responsible for 3.5 sacks on the year while Givens only has one. They are part of why Penn State's rush defense is ranked #69 in the country, giving up 161 yards per game, including 224 to Indiana, 245 to Pitt, and 245 to Illinois(!). The linebackers have not been the most helpful. You may remember MLB Jan Johnson (#36) from 2016 when Penn State had a lot of linebacker injuries coming into the Michigan game. He has 23 solo tackles and an interception against Illinois. But given a one-on-one trucking match-up between him and Ben Mason, advantage goes to Mason. His 28 solo tackles, as a cornerback, are also impressive. If Michigan survives the defensive ends, this will be the next match-up to watch. Could the rumors be true that Tarik Black may make a re-emergence in this game? Penn State is good at stopping teams with one very good receiver. 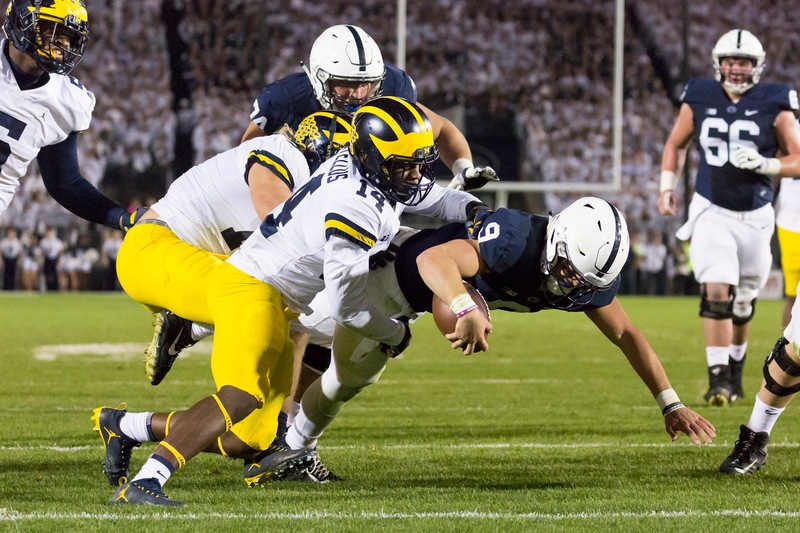 Michigan has three, and Penn State is ranked #66 in passing yards allowed. Penn State's powerful defensive end unit gets held-up and Patterson exploits the corners with multiple receivers. Higdon blasts through a weak linebacker unit for over 150 yards. James Franklin commits coaching malpractice as he seems to do in all of his biggest games. On defense, Don Brown seeks bloodthirsty revenge and rattles an already banged up Trace McSorley. Alabama and LSU somehow both lose. Just kidding, Trace McSorley is just fine and gashes Michigan on the ground. The Penn State offense probably doesn't put up numbers like last year, but puts up enough points to win. 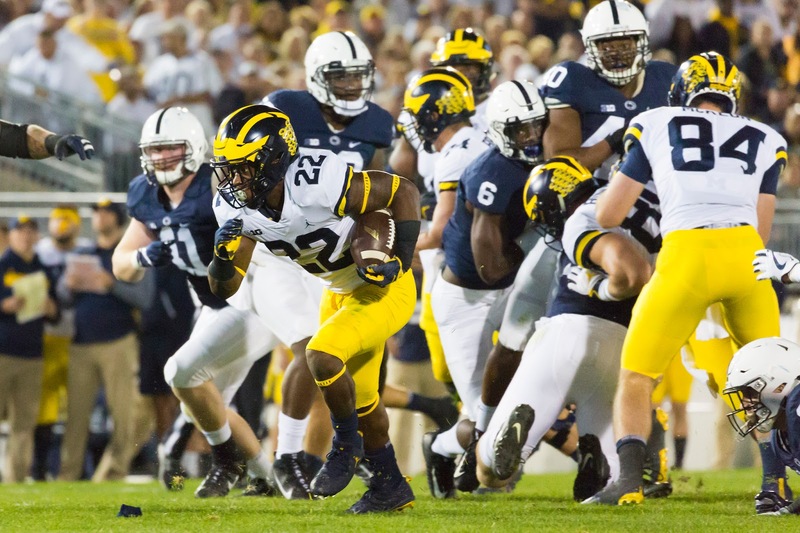 Michigan's offensive line struggles against a deep rotation of Nittany Lion defensive ends and Patterson is unable to hit targets against good cornerbacks. Michigan's offense has to rely on Higdon but it's not enough. A loss means Michigan is eliminated from any playoff hope, but the Big Ten Championship is still very much on the line. James Franklin lost to Brady Hoke. In 2014.